In one of the sermons by C H Spurgeon he gives proof to the fact that he visited Derbyshire on at least one occasion. Whether he came more often I am unaware. This fascinating information is confirmed in one of his sermons, which he preached in South Wales, in 1861. At the time Spurgeon would have been about 26 or 27 years old, having been born, in 1834. So as to not embarrass the people of the church he was speaking of, we will simply say that the church in Derbyshire was in the North-East of the county, not more than eight miles from where our church is, here in Crich. Here then is the extract in which he refers to his visit. The extract is taken from notes in Spurgeon’s Sermons Volume 62: 1916, on the Sum and Substance of All Theology, a sermon delivered by C H Spurgeon, at the Bethesda Chapel, Swansea, on June 25th, 1861. I was preaching, not very long ago, at a place in Derbyshire, to a congregation, nearly all of whom were Methodists, and as I preached, they were crying out, “Hallelujah! Glory! Bless the Lord!.” They were full of excitement, until I went on to say in my sermon, “This brings me to the doctrine of Election.” There was no crying out of “Glory! and “Hallelujah!” then. Instead, there was a great deal of shaking the head, and a sort of telegraphing round the place, as though something dreadful was coming. Now, I thought, I must have their attention again, so I said, “You all believe in the doctrine of Election?” “No, we don’t, lad,” said one. “Yes, you do, and I am going to preach it to you, and make you cry ‘Hallelujah!’ over it.” I am certain they mistrusted my power to do that; so, turning a moment from the subject, I said, “Is there any difference between you and the ungodly world?” “Ay! Ay! Ay!” “Is there any difference between you and the drunkard, the harlot, the blasphemer?” “Ay!! “Ay!” “Ay!” Ay! there was a difference indeed. “Well, now,” I said, “there is a great difference; who made it then?” for, whoever made the difference, should have the glory of it. “Did you make the difference?” “No, lad,” said one; and the rest all seemed to join in the chorus. “Who made the difference then? Why, the Lord did it; and did you think it wrong for Him to make a difference between you and other men?” “No, no,” they quickly said. “Very well, then; if it was not wrong for God to make the difference, it was not wrong for HIm to purpose to make it, and that is the doctrine of Election.” Then they cried, “Hallelujah!” as I said they would. 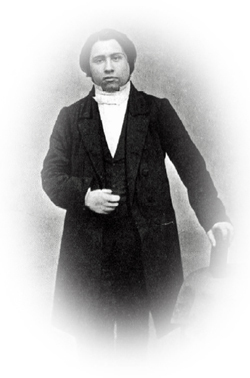 Just about three weeks prior to Mr. Spurgeon’s visit to Derbyshire, we too were greatly blessed to receive a visit here in Crich, from that other great Victorian preacher, J. C. Ryle. At the time, Ryle was Rector of the Parish Church, in Helmingham, Suffolk. Information about that visit can be found elsewhere on this website. Click this J C Ryle link to read about Ryle’s visit to Crich.